Some of the best real-life practice might just be with guns that aren't real. 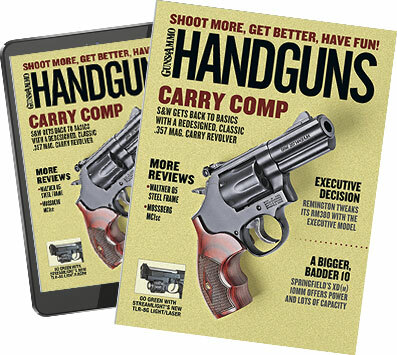 The quest for improved firearm training has gone hand-in-hand with the search for improved firearm training tools. When people think of those tools, they usually envision high-tech, self-resetting targets, 360-degree shoot houses, grip strengtheners or grip-mounted lasers. Hardly anybody realizes that one of the most important watersheds in firearm training was the gun culture's discovery of the Nelspot 007. Designed as a tool to mark trees and cattle, the Nelspot 007 has another distinction: It was the first paintball gun. Single-shot and CO2-powered, in technological sophistication it's like a flintlock compared to today's full-auto bucket-fed paintball guns, but as soon as one person shot another person with one, the genie was out of the bottle. In the late 1980s, the theory of using projectile firing "non-guns" for training took another huge leap forward with the introduction of Simunitions. To paint simply and with a broad brush, Simunitions are cartridge-fired paintballs that can be fired only out of slightly modified duty weapons. A Glock 34 (bottom) and its airsoft replica. Quality airsoft guns have both the look and the feel of their real counterparts, making them great training aids. Because airsoft guns are so realistic looking, be prudent about where and how you display them in order to avoid any misunderstandings with police and the public. Simunitions' value as a training tool can be seen by their worldwide use by military and police agencies. Training intensity always goes up when there's somebody out there shooting back, even if it's only with a "paintball" gun. There have been studies with officers wired up to heart monitors during house-clearing exercises, and when those officers know there is somebody else in the house waiting to ambush them--even though they know it's only with a non-lethal tool--heart rates go through the roof. While immensely valuable, there are problems for the average civilian wanting to use Simunitions to train. First, foremost--and unfortunately--Simunitions are not sold to civilians. Second, even though some civilian training facilities have access to Simunition-converted weapons, they're not cheap to use. Also, their utility is restricted to "opposing force"-type training situations; nobody uses Simunitions to target-shoot at the range. And last, according to Simunitions' own website, "Improper use of Simunition ammunition can cause injury, loss, damage or death." While that warning sounds a bit overly dramatic, and no doubt was penned by a corporate lawyer, Simunition projectiles are powerful. Numerous police agencies and civilian training academies have tried training with paintball guns over the years, but they have certain disadvantages, too. None of the quality paintball "markers" (the industry has shied away from the term "gun" in recent years) mimic commercially available firearms in look or feel, so their utility as training tools is lessened. Second, and perhaps just as important, paintballs make a huge mess. If you've ever seen indoor paintball championship matches on ESPN, the field looks like a gooey kaleidoscope. They can only be used outdoors, and only where the mess won't matter or can be hosed off. The disadvantage common to both Simunition-weapons and paintball guns is that they really become useful only when going head-to-head against an opponent. Enter airsoft. Say "airsoft" and most gun owners will have some sort of immediate reaction, and not necessarily a positive one. David En, of JAG Precision, a wholesale importer of airsoft guns and accessories, wants to take everything airsoft out of America and start all over again. "It was introduced in entirely the wrong way," he explains. "At the time airsoft first became known in the U.S. it was marketed to all the guys doing paintball, so the first thing they did when they got all these airsoft guns was to go out and start shooting each other. And the only ones being imported were these cheap toys." And that first impression has stayed with the mainstream gun culture. Airsoft pistols are powered by green gas, which fires the projectile and also cycles the slide. The gas is a mixture of propane and silicone oil. Shooters have for years used .22 conversion kits as a way to practice cheaply, and most quality airsoft guns aren't much more expensive than a quality .22 conversion kit. Further, they have several advantages over a cartridge firearm. When it comes to training the young, scared or just plain inept, even a .22 short, if misplaced, can mean a funeral. Most new shooters have a big problem with muzzle control, with keeping their fingers off the trigger a close second. As long as everyone is wearing eye protection, training with airsoft means the worst that's going to happen is somebody goes home with a welt. Another huge advantage to training with airsoft is that it can be done indoors. Put up a sheet of plastic with a rolled edge on the bottom, and all you need for cleanup is a dustpan and broom. Targets and other accessories for airsoft make it even more realistic. Further, the look, weight and feel of airsoft guns has now gotten so close to the real thing as to not be an issue anymore. How about accuracy? Because airsoft guns can be used indoors where distances are typically shorter than standard training, several different companies offer miniaturized targets specifically designed for the tactical airsoft market. Falling and swinging plates, bowling pins, and perfectly proportioned IDPA/IPSC targets are all available. My airsoft Glock 34 can do two-inch groups at five yards which, on the reduced targets, gives me the same sight picture I'd have shooting at full-size targets at 15 yards and beyond. Airsoft pellets can be had in different weights and colors. I was told to use black pellets, as they're harder to see in flight. I didn't understand that until I was practicing using white pellets and found myself watching the pellets fly instead of my sights. Those in the know recommend heavier pellets. Airsoft practice is about accuracy, not distance, so the difference in range between pellets isn't as important as how they buck the wind. Airsoft is huge in Hong Kong and Japan, due in part to the fact that all of the guns and gear are now nearly indistinguishable from the real thing, and the real thing isn't legal to own over there. "There are massive, organized team competitions over there," En explains, "whereas over here, the first thing anybody knew about airsoft was kids' toys and idiots shooting each other. There, airsoft is very serious, and guys have thousands of dollars invested in their gear." Because they can't get the real thing, some of En's customers overseas are willing to pay more for a custom IPSC-style airsoft pistol than the real things cost in America. "I can't sell those here; there's no market for it," En says. "Who's going to pay $2,500 or $3,000 for a customized airsoft gun [in the U.S.]?" Most quality airsoft replica pistols range between $200 and $300. When I wanted to obtain a "Glock" airsoft gun for this article, En's first questions showed me how much airsoft has matured in this country. "What model?" he asked me. "Glock 17, 21, 34? And do you want that with a plastic or metal slide?" Many shooters reading the above price tags might currently be suffering from heart palpitations. Two hundred dollars! For an airsoft gun? Hear me out. I settled on an airsoft version of the Glock 34 Practical/Tactical model with an aluminum slide and, apart from the markings on the slide, it is indistinguishable from the real thing until held in the hand, and then barely. Airsoft mags power the system in addition to housing the ammo, and care should be taken to avoid dropping them as they damage easily and are expensive. My airsoft "Glock" weighs in at 26 ounces and change, which is two ounces heavier than an unloaded Glock 34. How does it feel in the hand? The balance is different; most of the airsoft gun's weight is in the metal magazine, whereas in a real Glock most of the weight is in the slide. As for the trigger, it's similar to a standard Glock trigger in length and feel, if a bit lighter in pull--about four pounds. While my son's Crosman airsoft subgun runs off AA batteries, the realistic, expensive airsoft guns use "green gas" as a propellant; it also cycles the slide. What is green gas? It's propane with silicone oil added. The silicone oil apparently helps lube the gun and reduces the flammability of the propellant. Users are cautioned against getting the gas cans near open flames, and even with my public school education I'd say that sounds like a good idea. The airsoft magazines are more than just projectile feeders. They contain the gas reservoir as well and are refilled through a port on the bottom of the magazine, concealed by the basepad. While the magazines are constructed of steel, they do have plastic parts, and I wouldn't recommend dropping them on the ground while practicing mag changes. The airsoft mags cost more than the real thing. Western Arms is just one manufacturer of realistic airsoft guns. While the company specializes in 1911 and 2011 variants, it also offers airsoft Beretta 92s and M4-type AR-15s. I was able to test a Western Arms copy of a high-capacity Strayer-Voigt 2011, and even in the hand it felt like a real gun, with the feel of metal in the palm and a weight to it toys just don't have. As an aside, these guns are realistic enough that you have to use common sense on when and where you pull them out. You could attract a lot of unwanted law enforcement attention if you were to, say, be seen waving one around in public. Some airsoft guns have orange muzzles, but not all of them, and even so, that's just a little bit of orange on a lot of what looks like real gun. I had a friend drop by the house recently, and I handed him a Glock airsoft pistol without saying anything. He carries a gun regularly, and shoots competitively, but doesn't own any Glocks. As any good shooter he treated it like a loaded gun, pointed it in a safe direction and dropped the magazine to start clearing it. He stared in confusion at the airsoft magazine in his hand for several seconds before he realized what he was looking at. Pro shooter Taran Butler, recently profiled in these pages, has experience training police officers, military and Hollywood celebrities. His 20-acre range in Simi Valley used to feature a paintball facility, but it was under-utilized. "Only the kids wanted to use it," Butler explained, and the visiting celebrities there to train for movie roles could hardly walk across it without getting paint from exploded paintballs on the cuffs of their chinos. Butler's paintball facility has been replaced by an urban combat training area, one that employs airsoft guns for practice within its buildings, streets, alleys, sewer pipes and other city-mimicking features. A local SWAT unit trains at the facility, as have officers from other departments and units from Fort Benning, Georgia, which indicates just how useful the people in harm's way are finding airsoft as a training tool. The future of airsoft in America is finally looking up, as far as David En sees it. The mainstream "gun culture" is starting to realize the utility of airsoft guns and gear when it comes to training. These realistic airsoft "guns" are in such a league of their own that I don't think the word gun fits anymore. I think if they were marketed as airsoft "trainers"--especially with today's economic conditions and ammunition prices they way they are--dealers would find it hard to keep them on the shelves.